Structural diagram showing electron hopping from an Fe2+ ion at an octahedral (B) site to an Fe3+ ion at a tetrahedral (A) site in Fe2CrO4. Enlarge Image. Mined to make the first compass needles, the mineral magnetite is also made by migratory birds and other animals to allow them to sense north and south and thus navigate in cloudy or dark atmospheric conditions or under water. A team of scientists has compositionally modified magnetite to capture visible sunlight and convert this light energy into electrical current. This current may be useful to drive the decomposition of water into hydrogen and oxygen. The team generated this material by replacing one third of the iron atoms with chromium atoms. The team is from Pacific Northwest National Laboratory (PNNL) and includes researchers from EMSL, the Environmental Molecular Sciences Laboratory, a DOE Office of Science user facility, and Argonne National Laboratory. 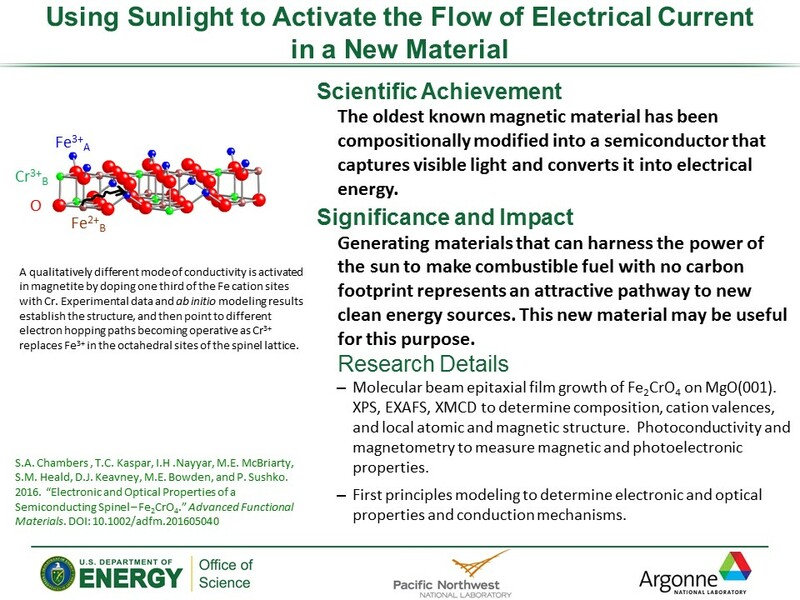 Why It Matters: Generating materials that can harness the power of the sun to make a combustible fuel such as hydrogen, which would have no carbon footprint, represents an extremely attractive pathway to new clean energy sources. Without alternatives to fossil fuel, we are committed to steadily increasing the concentration of carbon dioxide in the atmosphere and the oceans, with the attendant deleterious effects on greenhouse gas accumulation in the atmosphere and ocean acidification. Methods: By taking advantage of the compositional precision, purity, and low defect densities found in oxide films prepared by molecular beam epitaxy, the team showed that an unusual semiconducting phase, which is ferrimagnetic well above room temperature and absorbs light in the visible portion of the solar electromagnetic spectrum, can be stabilized on magnesium oxide (MgO(001)) substrates. This phase results when precisely one third of the iron (Fe) in magnetite (Fe3O4) is replaced with chromium (Cr). The investigation revealed that chromium ions, Cr3+, substitute for iron exclusively at octahedral sites in the spinel lattice, occupying half of these sites. As a result, the charge transport mechanism involves electron hopping between iron cations at octahedral and tetrahedral sites in the lattice. What's Next? Having shown that chemically modified magnetite (Fe2CrO4) meets the basic criteria required for an air stable, visible light photocatalyst, the investigators plan to carry out experiments in which they will transfer freshly grown Fe2CrO4 surfaces to a photoelectrochemical cell under a dry nitrogen atmosphere to avoid picking up surface carbon contamination. There they will measure the photocatalytic activity for the oxygen evolution and hydrogen evolution reactions, as occur when light energy is successfully used to break water down into useable fuel. In one sentence: Scientists discovered a new material that absorbs visible light to generate electricity; this material might be useful for splitting water to produce a combustible fuel, hydrogen.